Nothing like a bit of gaming gets the blood flowing, especially when the stakes are high. However, when they aren't very high (or at all), but you're quite the competitive person, anger has the potential to flow through you like no other. That said, gamer rage is rather well-known, even leaving some players with broken keyboards, controllers, etc. 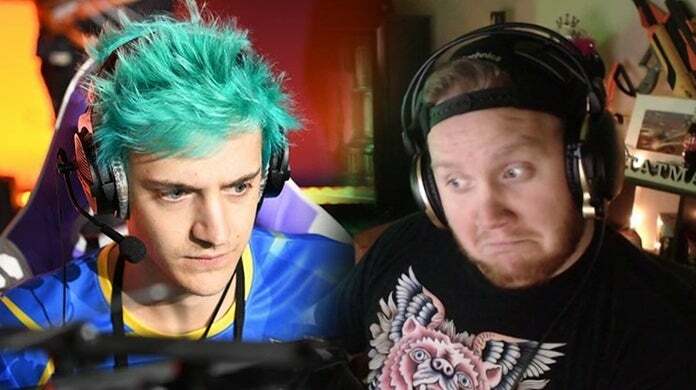 It's even been known to make you yell at your friends, which is exactly what popular Twitch streamer Tyler "Ninja" Blevins recently did while playing a bit of Fortnite with Tim "TimTheTatMan" Betar and Paul "ActionJaxon." During a recent Fortnite session, the three streamers dropped in Retail Row, otherwise known as Tim's "home and native." While scoping out the scene, Ninja falls victim to an enemy combatant's SMG, which seemed to hit every last shot thrown in Blevins' direction. After being thirsted, the popular streamer is visibly upset, especially after Tim asks, "You're really out here dying this game?" Of course, nobody is perfect and we've all been angry before while playing video games. Nobody remembers the days of split-screen multiplayer in GoldenEye 007 on the N64? Besides, this is pretty tame for Ninja, who has certainly toned things down a notch since his Halo days. TimTheTatMan would go on to bring the kill home for Ninja, but then shot a sarcastic remark his way. "That guy killed you," Tim asked. "That's tough, dude." The three of them got a good chuckle out of the incident, especially after Tim tossed the "Take the L" emote at the combatant's left-behind pile of loot. To summarize, Ninja died, got a little heated, sarcastic anger was tossed around, laughs were had, and I am pretty sure nobody is losing any sleep over the situation. If so, the issues might go beyond Fortnite. What do you think about all of this? Was Ninja's momentary anger warranted, or does he just need to "git gud?" Let us know in the comment section below, or feel free to hit me up over on Twitter @anarkE7!